Grady focuses his practice on workers’ compensation, workers’ compensation mediation and appellate advocacy. He is a co-author of The Law of Workers’ Compensation Insurance in South Carolina, Sixth Edition, a comprehensive book analyzing this complex area of law. 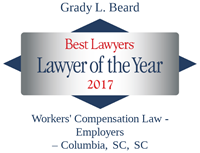 Grady is a Fellow in The College of Workers’ Compensation Lawyers and is a member of the National Workers’ Compensation Defense Network. He serves on the board of the South Carolina Workers' Compensation Educational Association, is active in the South Carolina Defense Trial Attorneys' Association and has been consistently recognized by Best Lawyers.